This inexpensive, 14 gallon capacity poly tank comes with a fiberglass cover and a bolt-on steel neck with a billet cap. The neck and cover can be painted to match your car for a total original look. (The bottom of tank will be a contrasting black). 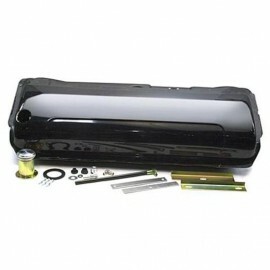 This tank also features a top mounted pick-up tube, internal baffling, roll over vent valve, sender mount for all aftermarket senders, and has been leak tested. Note: Frame/Cross bar shown in photo are for installation/photo purposes only and are not included with this tank. Will not work with frame rails that are boxed beyond the crossmember.